I recently worked with London agency Frank PR to secure national media coverage for their clients, bookmakers Paddy Power. The agency and client have a well-established reputation in the PR world for outrageous stunts and unusual guerrilla marketing techniques. So I was super hyped when asked to help them for a shoot in Liverpool. The aim was to provide a fun story in the media, to back up an above the line poster and media campaign featuring the latest antics of Liverpool striker Mario Balotelli. In the days prior to the shoot at Anfield, Balotelli angered his manager Brendan Rodgers by swapping shirts at half-time. 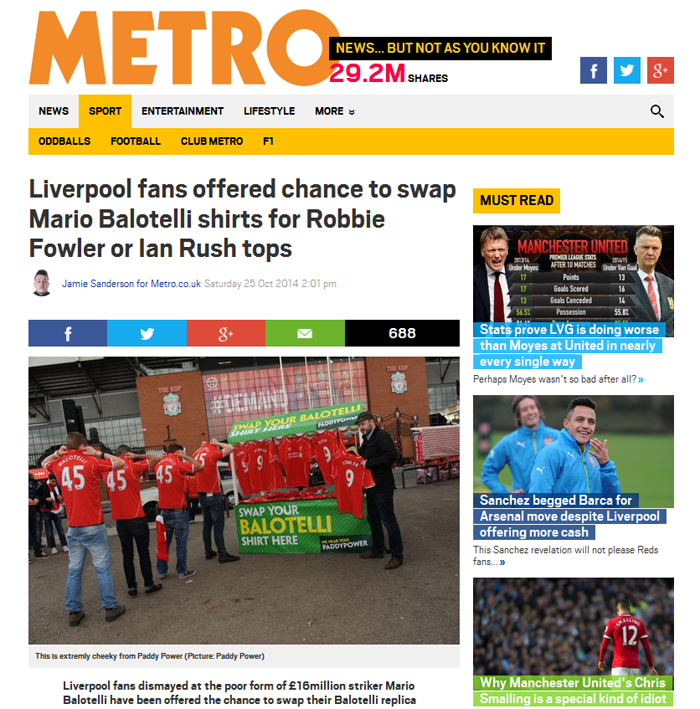 So, the idea was to allow fans at the next home game, the opportunity to swap his shirt for a Liverpool legend - offering free Robbie Fowler and Ian Rush branded replica shirts. The PRs arrived at the ground and after a quick location scout, we decided on our spot for the photos and or course had a little back-up plan, in case anything went wrong or we were asked to move. Then a van arrived with the necessary branding, replica shirts and a mock up market stall ! After finding some willing volunteers, we went for it and got the shots the clients required. A quick camera-phone shot emailed directly confirmed this and then we rushed to a Wi-Fi zone to do a final edit, caption and then send over the images to Frank PR's offices in London. Within an hour, social media was buzzing about the stunt, with 4K retweets from the Paddy Power account and lots of other features on targeted sites, the client was happy. The next morning it also hit the nationals as well, including The Daily Mirror, The Star and the Metro , so a really successful photo shoot in terms of coverage. If you've arrived here looking for professional photographers in Liverpool, you've come to the right place - give me a call on 07810 321634 and if I can't help you, I'm sure I know someone who can.